Candles are a common tool of the Craft. As witches, we use them in spells, rituals, divination and more. We can dress them up in all sorts of ways to better focus the energy towards our intended purpose. 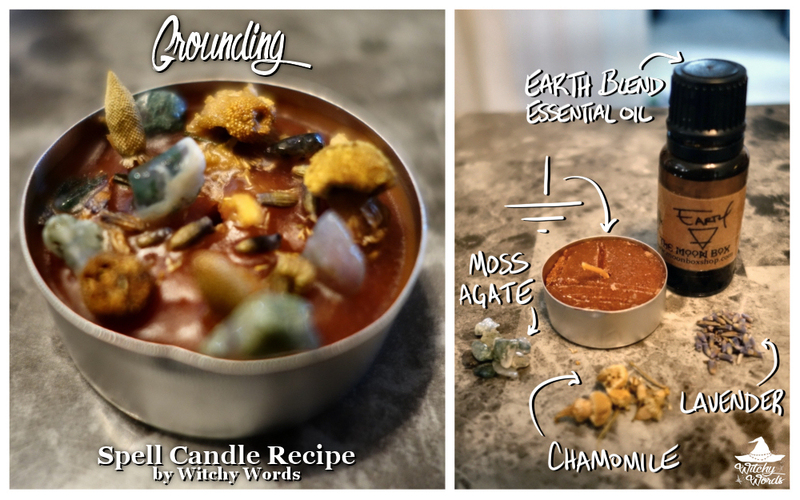 From salting candles to charging, a vast array of methods exist to create spell candles. 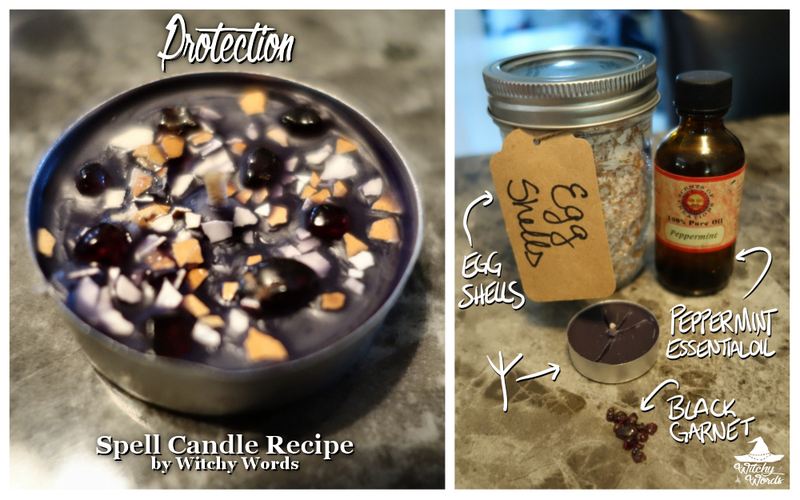 Today, by popular request, we're going to discuss just one of many techniques based on the candles I made for my 10k Giveaway box a while back. 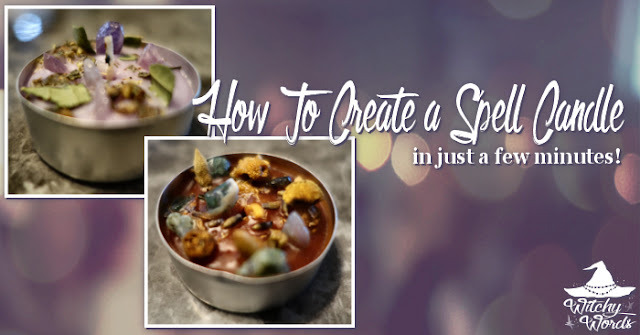 This method, while producing an elaborate appearance, is surprisingly simple and creates a completed spell candle in just a few minutes! Here's how! Heat Gun or Hair Dryer: A craft heat gun with low airflow would probably work best for this but, if you don't have one, don't worry! Nor do I. I use my hair dryer and get a similar effect. Be warned: Depending on the speed of your hair dryer and the wax in the candle, you may get some wax splatters! A Tea Light Candle in an ALUMINUM Holder: I cannot stress this enough. Some tea lights, particularly ones made of soy, come in plastic holders. Unfortunately, this plastic has a low melting point and is prone to catching fire. I strongly suggest using a tea light in a simple aluminum base. The candle itself should be whatever color you need for your purpose or, if you don't have a specific color, white will do in a pinch. You can even color the candle yourself with crayons or food coloring, though that's a tutorial for another time. Herbs: Any dried herbs that fit your purpose and are safe to burn will work perfectly. If you're working with whole dried herbs, crunch or grind them up in advance. Essential Oil and Dropper: Again, any essential oil that's safe to burn and fits your goal will work. Having a dropper makes it easier to add your favorite essential oil to the candle. Semi-Precious Gemstone Shards: It's important that you're working with small pieces of gemstones rather than large ones as you don't want to smother your candle! Carving Tool: If you want to inscribe a sigil into the wax of your candle, a carving tool is handy. While many people use a kitchen knife, X-Acto knife or other sharp object, I find a bottle opener seems to work best - and is far safer! Your first step is to select the candle you're going to use. Any tealight with an aluminum base will work. I tend to pick tea lights that have flaws, such as the large chunk missing out of the brown one below. These tea lights may not look pretty now but they can be fixed with this process! Next, if you're going to carve a sigil into the wax, you should do that now. This is entirely optional but can be an effective way of charging your candle. The sigil will be activated by the heat and merge its energy into the wax as it melts. If you make a mistake with your sigil, don't worry! You can heat the candle up using the hair dryer and it'll be good as new, ready for a fresh start! Make sure the wick is standing up. You'll want to repeat this step every time before you heat the candle to ensure you don't lose the wick in the process. Now comes the first time you'll heat up the candle using your hair dryer or heat gun. You will do this between each step. Watch your fingers as this can get very hot! Have your candle resting on a heat-resistant surface, such as a stove top, skillet or hot plate with any precautions nearby for hot wax or burns. Once the top layer of the wax is melted to a liquid state, you're ready to add a few drops of essential oil if you like. I start with the essential oil because it's already liquid and easy to mix with the wax. You also won't be overheating and losing any other components in the process. Keep in mind that you'll need to move quickly between each step as the wax will harden fast! After standing the wick back up and heating it with your heat gun or dryer again, you'll be ready to add any herbs to your spell candle. Again, make sure you reach a liquid state - not just soft wax - before adding your herbs. I choose herbs as my second addition because I still have plenty of space and little direction over exactly where the flakes of the herb land. You'll also want to press your herbs into the wax gently with your nail or heat-resistant tool such as a butter knife or spoon. This secures the herbs so that, when you use the blow dryer again, they won't fly out. 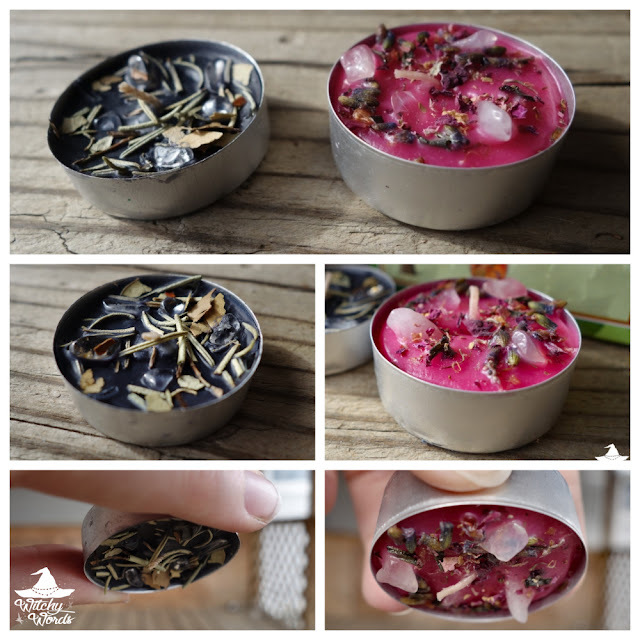 Finally, after ensuring the wick is standing and hitting the candle with the heat gun or hair dryer again until the wax is at least soft, you can add any gemstone shards you like. Here, you have more control over where the gemstones land. Press them firmly into the wax to ensure they won't blow out. Heat your candle for the last time with the blow dryer or heat gun and allow it to cool completely. In the end, from the first heat to the last, this whole process takes just a few minutes! 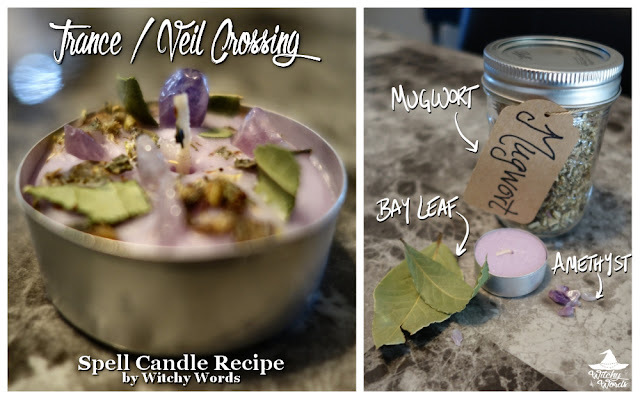 Once you are done, you should have a spell candle infused with sigils, essential oils, herbs and/or gemstones that won't fall out when held upside down! You're now ready to use your spell candle in any way you see fit! Once again, it's important that you use a tea light candle in an aluminum holder and perform this craft on a heat-resistant surface with all the safety precautions needed nearby. Gather everything you need to create your candle before you begin. Trust me, that wax will harden way faster than you anticipate. The process is so fast and it's much easier if each component is within arm's reach. If you're working with a hair dryer, be prepared for it to blow everywhere unintentionally. I like to place a sturdy cup over my components - any herbs, gemstones, etc - that I'm working with while I'm heating the candle to avoid these items flying off the table. Heat the candle with a heat gun or blow dryer from the top instead of using a hot surface like a candle warmer or the stove on a low setting. If you heat the candle from below, you will lose the wick. It will slide to the side, drop into the wax and generally be impossible to stand back upright. Be sure to lift the wick and hit the candle with heat between every step and at the very end. This secures each component, ensuring that they cannot fall out of the candle. 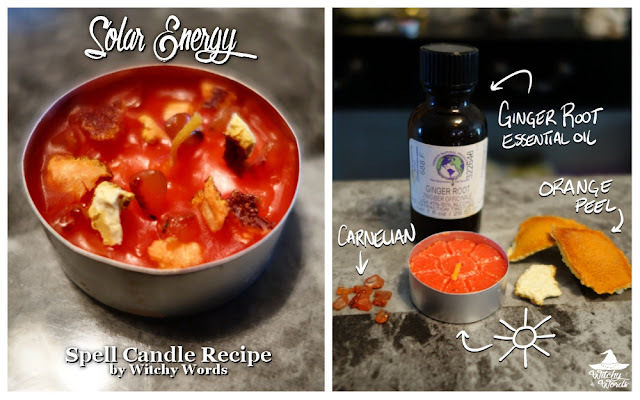 Don't feel like you have to carve a sigil into the wax and add essential oil and add herbs and use gemstones. I like to pick three or four components (ie two herbs and an essential oil) and keep it simple. Thanks for this tutorial! 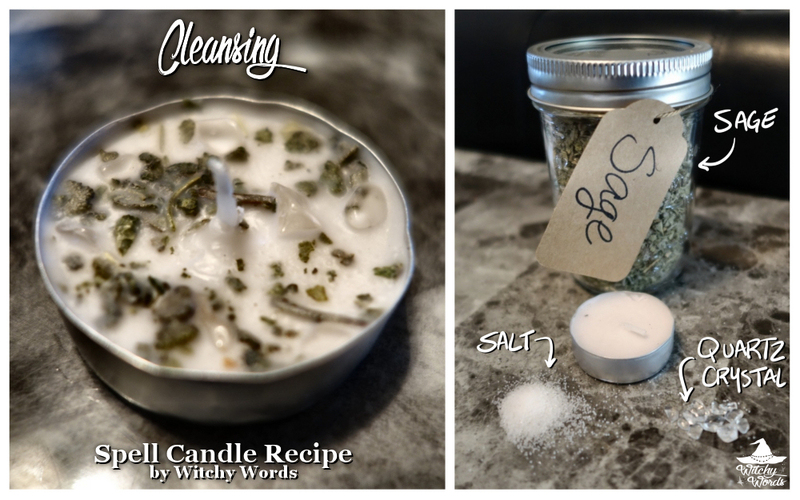 I will try it soon with some of the many tealights I have at home! I love that you can fit several different elements into such a small package. That's one of the reasons these have been my go-to spell lately. I can make a bunch in bulk on a high energy day and then just light one as I need!